Blog So Why an Online UPCAT Review? Harness the power of the Internet. You can pass the UPCAT – a bright future at your fingertips! It is the information age. Almost every information is now accessible through the internet. Almost everyone uses the internet. And using the internet as a tool to prepare for exams can really give you the advantage. The Online UPCAT Review is the latest UPCAT Review course developed by UP professors. It is conducted via the internet and optimizes the use of e-learning software, Facebook, YouTube and SlideShare to deliver the review. 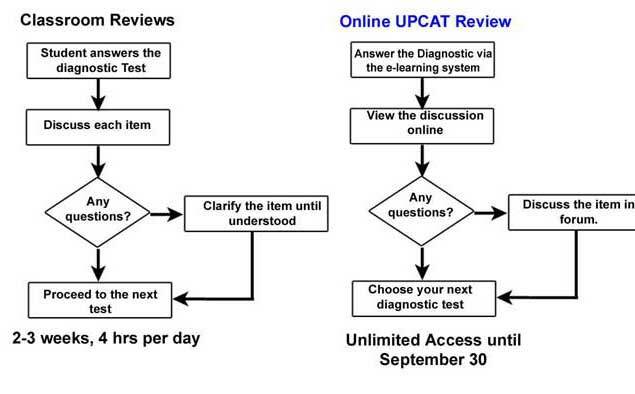 However, the method of delivery sets the Online UPCAT Review apart. In the traditional classroom review, the students will be attending class sessions where they will answer diagnostic exams and then the lecturer would discuss each item of the diagnostic test. If the student has questions, then the teacher will answer the quuestion and have a short clarification of the topic. This method has been proven effective over the past and is being used by all review centers. The Online UPCAT review is unique in the delivery because; instead of a regular classroom, the review is delivered right at your homes via the internet. The student will answer the diagnostic test using our e-learning program. Then each item of the diagnostic test will be discussed, but this time, the discussion will be done either through text, YouTUBE or SlideShare. We will even include links to other materials that would make the topic even easier to understand. And, if the student still needs clarifications then he or she may post it in the forum for further discussion. But maybe one of the best advantage of the Online UPCAT Review is the UNLIMITED ACCESS until September 30 unlike traditional classroom reviews that usually last only 2-3 weeks, giving more time for the student to truly understand the lessons being taught. How much is the Online UPCAT Review? The Online UPCAT Review has two access levels: the FREE access level and the PREMIUM access level. The Free access has a complete set of reviewers for math, science, language and reading. Aside from these, you also get access to the free Review Masters newsletter and other downloadable materials. The Premium access, on the other hand, is only Php 1500 for the entire program (click here for the different packages). The reason it is priced so low is because we no longer need to pay the rent for venues and no longer need to pay the teachers each time they repeat their lessons unlike the traditional classroom type reviews. It contains the materials in the Free version plus an expansive set of reviewers. Each subject is broken down into subtopics for a more comprehensive approach to the review. Should I still enroll in a classroom type review center? It is up to you. The classroom review has the benefit of actual physical contact with the teacher and other students; some students still need this interaction. However, there are students who will take only the Online UPCAT Review because of reasons such as: travelling out of the country during summer, classroom review schedule conflicts with their family schedule and, of course, classroom reviews are expensive. Note: Plenty of students enroll in the Online UPCAT Review while still enrolled in traditional classroom reviews. This is simply because the classroom review is too short. The students will then discuss, in our forum and FB groups, any questions that they weren’t able to understand from their classroom review. Review Masters has the UPCAT Success System which combines the classroom review with the online review plus a whole lot more. Click on the link to know more about the whole program. May i know the schedules for the review? May i also ask the success (passing) rate of your examinees?